As far as I see it there are two reasons to come to CeBIT – to meet people and to learn new things. On both of these accounts my second day at the world’s biggest ICT trade fair was hugely successful. I spent some time today meeting exhibitors on the SA National Pavilion. (Isn’t it strange to travel thousands of kilometers to meet fellow South Africans!) There are 14 companies on the Pavilion, most of them are small and innovative with an eye on the future. Korwe Software is based in Cape Town. 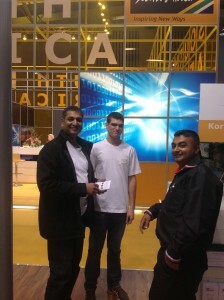 It is represented at CeBIT by Nithia Govender and Tjad Clark. They are launching a new product at CeBIT – a “context engine” that helps mobile users filter information based on their position and other preferences. For example, a vegetarian traveller in Hanover searching for the closest restaurant on her cell phone would get different suggestions compared to her meat-eating companion. Wiscor Technologies is from Durban. It’s part of the “Oval Group” who is very active in the tertiary education space. Wiscor’s main offering is “Infiniti Place 2.0” which is a “travelling classroom”. It gives students access to e-lectures, e-books, e-dictionaries and YouTube videos. Wiscor’s software systems satisfy all of the reporting requirements for the SA Council for Higher Education. Pravin Maharaj and Avi Maharaj are representing Wiscor on the National Pavilion at CeBIT. “invirohub” is a smart energy monitoring solution. It integrates any compliant smart-meter, energy monitoring and leak detection products into a system that has been used by utilities, municipalities, commercial properties and light industrial clients. Lance Manala is representing the company at CeBIT. Mohammed Badat is the CEO of MyVoip Communications. This is his company’s fourth visit to CeBIT. They first came in 2007. MyVoip has an innovative “School Diary” product. They also support clients in implementing SOA-based integration of various systems. I asked all of these exhibitors whether it was worthwhile coming to CeBIT and if they thought the SA National Pavilion was of value to them. Without exception they all felt coming to CeBIT made good business sense. Lance (from invirohub) said that with help from the CeBIT organisers he had targeted particular companies from all over the world who were offering similar solutions to his. He was able to visit them and learn about what they were doing. This has given him really valuable strategic insights into how he could develop his product in the future. Pravin Maharaj believes that South Africa’s involvement at CeBIT could be much more effective and valuable if more preparatory work was done beforehand. He makes the interesting point that it is not up to the dti to do this preparation. Companies coming to CeBIT and the SA ICT sector generally need to take responsibility to develop a strategy and marketing material that will enhance our participation at CeBIT. Watching the comings and goings on the Pavilion and having tens of conversations myself I have no doubt that having a substantial presence at CeBIT is good for the SA ICT Industry and for each of the exhibitors on our Pavilion. Hi Barry – the stand looks impressive! I sense that the value of CeBIT is not measured in sales revenues. How would you set about quantifying the values of the research, the network of contacts and the inspiration that comes from participating in such a big international event? Do you have any advice about how one maximises the value derived? Back in Cape Town now, and what an experience! I can totally agree on how huge this event was, never expected to be walking for such a long distance in the cold – Certainly walking a block or 2 to get to the CeBIT grounds was expected, but having to walk 4 or 5 blocks upon the CeBIT grounds to get to the pavillion, WOAH! Thank goodness for the constant stream of busses. So venturing through hall after hall of what the world had to offer in ICT, was rather extraordinary. I’d say my favourite was the R&D hall as I got to touch data for the first time with a technology that used collected data of CAT scans and remodelled the bones virtually with an interface allowing one to see the bone and have their finger stimulated by the attached pointer. Our expectations were exceptionally met! As mentioned, Korwe was launching their new Context Engine and exposure and feedback we got was phenomenal. It definitely served the purpose putting us many feet forward in terms of how we should progress further on this project. What was extremely good, was that this feedback was not only from the general public which we met on the final day, but also from people within the industry allowing us to receive, adjust and elaborate on ideas. I was very happy to be able to explore CeBIT and would definitely like to attend this plethora of knowledge again. @Adrian: This was certainly a large event, pretty much like travelling through a small village which was nothing of what we expected, a bit overwhelming one might say. In terms of maximising the value that you are able to receive, I’d say that you should be thoroughly prepared, not in terms of what you expect, but rather in terms of what you want to deliver. You have to ask yourself the question, “Why am I going to CeBIT?” And from there, it seems that CeBIT makes it easy for you. The people who were most interested in our product and gave the most interesting conversation, found us via the CeBIT application. So as an exhibitor, you would have to think carefully about the categories of people you are trying to target, and register under the correct categories – Korwe was the only context aware application exhibitors. As a spectator however, well .. Go for the full 5 days, the experience is very mind opening with many interesting people to meet which is difficult to achieve with less time.